The pilot compares participatory approaches in the case of big Cultural Heritage (CH) institutions with international audiences and with the case of small institutions targeting local users. It focuses on a group of German museums, showing their different roles and participatory approaches, depending on size, location and collection. Studies on tourism show the increase of short-trip holidays to capital cities and the visit to CH institutions is very often a part of the plans for the trip. On the other side, there are small town museums in rural areas whose collections are the physical documents of local memory and which remain outside the tourism of the international audience. Starting from the very different initial situation of big and small institutions, and with the rapid changes in ways of interacting through social media and digital technology in general, there are different ways for CH institutions to become inclusive institutions. A comparative investigation of participatory practices will be conducted. 21 June 2018, Berlin (Germany). 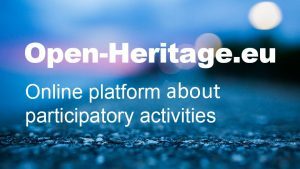 Conference: "Visions for Cultural Heritage and Digital Platforms"